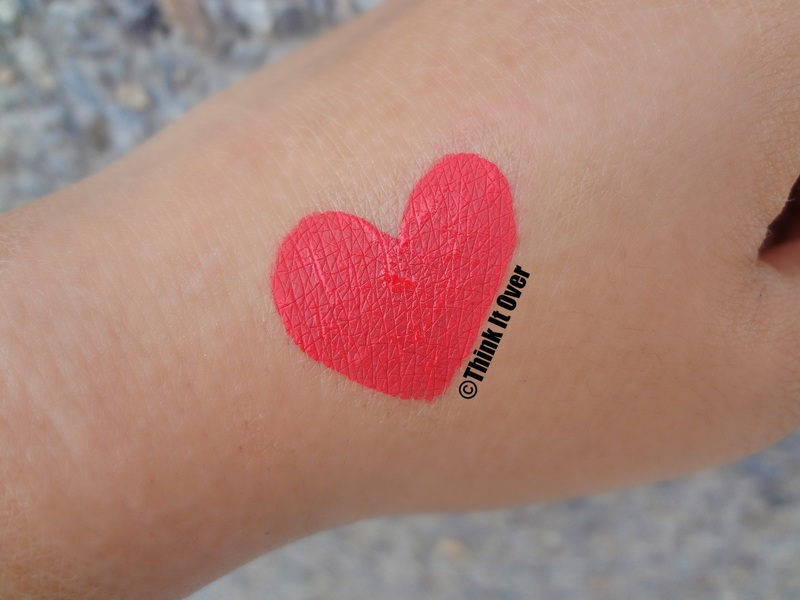 Blue Heaven - Non Transfer Lip Colour | Review , Swatch & LOTD! Description: A woman just needs a dash of makeup to complete her look for a special occasion, which stays on for longer. 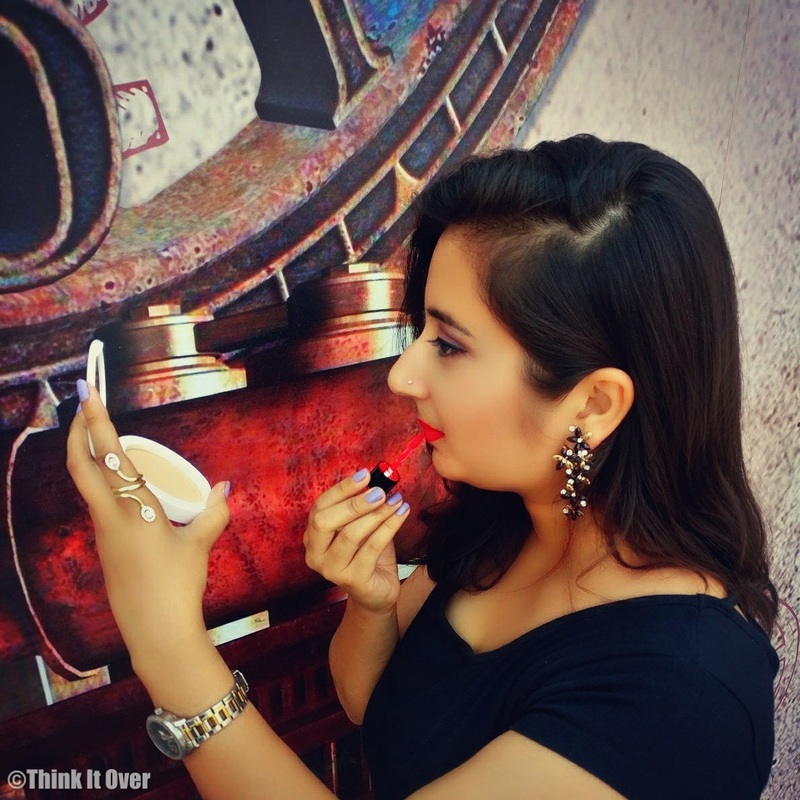 It is easy to apply and gives a glamorous touch to your look. 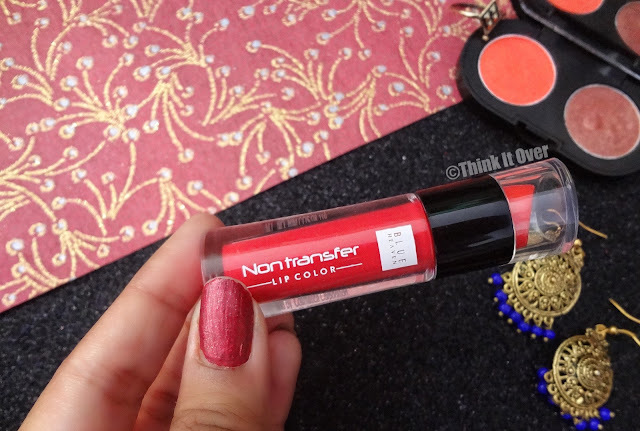 Blue Heaven transfer proof lip stain is a must have in your makeup kit, which has an extremely smooth matte finish to give an intense colour. Key Ingredients: Cyclopentasiloxane, Trimethylsiloxysilicate, Polyethylene, Silica, Mica and Approved Colours. · First, apply the lip colour on the upper lid and glide from one end of the lips to other. · Then move towards the lower lip & glide from one end of the lips to other. · Smooth out the corners of the lips well. Scarlet Red is not really a red-red but rather a soft red which at times looks slightly orangish to me and at others sort of pinkish red. I guess the packaging was deceptive because the top of the lid had somewhat orange shade; I assumed it to be an orange apt for summers! Mistaken on my end, I failed to read the shade name as it was kept inside cardboard sealed pack. 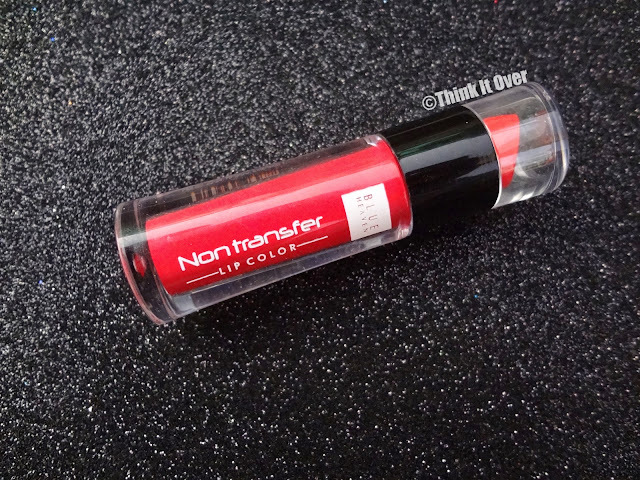 Packaging: The packaging of Blue Heaven’s Non Transfer lipstick is compact and travel friendly. It comes in a strong cylindrical plastic tube and the shade details are mentioned beneath. Somehow, the lid has top most part made of flimsy plastic which feels as if it might come off soon. Nevertheless, it hasn’t evacuated its place even when I exerted pressure upon it. Also, even if it comes off, it won’t hamper the product and your lip lacquer will still not leak. But this part cannot resist breakage upon fall. My mother broke mine few days back while dusting away the table! Applicator: It comes with a doe-foot applicator which is dissected at an angle which makes it easy to get into the corners of the mouth, so that you can skip upon a lip liner and accentuate your cupid’s bow. 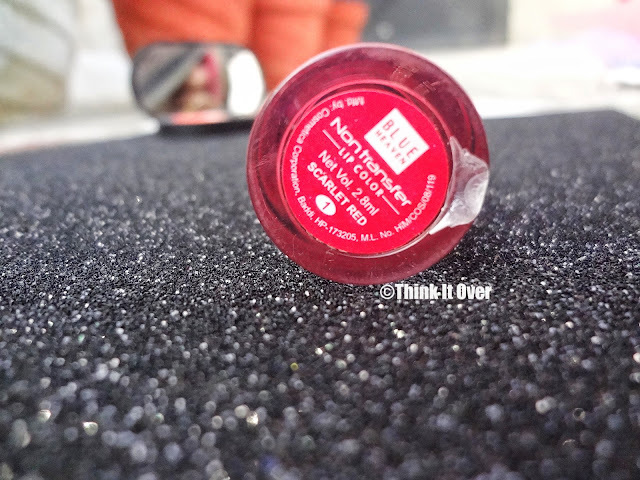 Texture: Initially I went to purchase this lacquer at a local cosmetics store and the guy there said that he won’t bring them to his shop such excessively drying lip color; which kinda made me sceptical too. But, based on my experience I feel these aren’t that drying but drying enough like all other matte liquid lipsticks. So, there’s nothing to complain about because that’s exactly the formulation which we’ve been obsessed with! All you gotta do is apply a layer of lip balm underneath and you’re good to go. In case you have flaky lips, it’s better to prepare your pout with a lip scrub. Longevity: The cardboard packaging of this lipstick claims that these liquid lipsticks last for 8 hours and are non-transferable. Now, I’d like to mention that these won’t transfer if you imprint your lips upon anything until and unless it comes in contact with anything liquidy or oily. The lip color did transfer when I had water directly from the water bottle. But the amount transferred is very negligible to take into consideration. As to the staying power, yes it does have the potential to stay upto 8 hours if you don’t have a proper mean with this duration. I have had two slices of pan pizza and the lip color did lighten but it did not evaded completely. Also upon lightening, your lips are left with beautiful tint of colour. · Small wand; makes it convenient for application. · Flimsy & fragile top of the packaging. Final Verdict: If taken into consideration its longevity & formula, this is one of the most affordable liquid lipsticks (of course after the Miss Claire Lip Creams)! Now, when I say affordable, I am by no means relenting upon its quality. 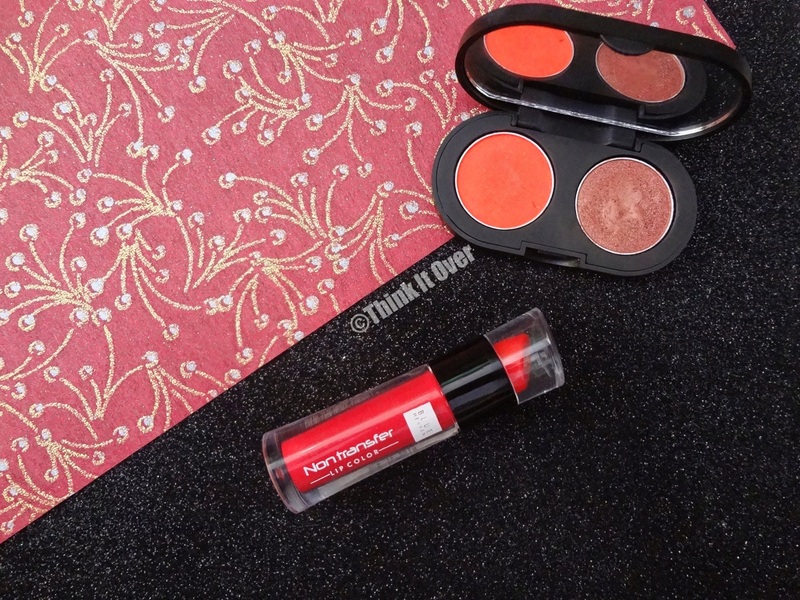 Sometimes, a lot of us underestimate various Indian drugstore brands such as Incolor. This is one of those gem which you ought to have in your vanity!